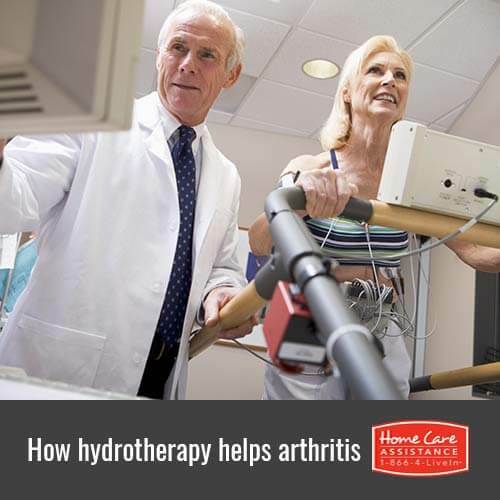 Hydrotherapy is a treatment that can help seniors who have arthritis ease joint pain. The difference between swimming and hydrotherapy is that it involves doing a series of special exercises in a warm-water pool. The exercises can be adjusted to a senior’s needs, symptoms and range of movement. Rhode Island live-in home care providers explain the benefits of hydrotherapy and how it helps seniors with arthritis. When seniors use hydrotherapy treatments, it will benefit them no matter how many of their joints are affected or what type of arthritis they have, including osteoarthritis and psoriatic arthritis. Normally a hydrotherapy session will involve a senior sharing a pool with other people while a physical therapist conducts the exercises. Although each treatment will most likely be tailored to a senior’s needs, sometimes seniors will be assigned to a group session with others who have similar arthritis conditions. Hydrotherapy can help seniors with arthritis in numerous ways. The warmth of the water will help relax their muscles and ease the pain and inflammation in their joints. The water also will support seniors’ weight, which will help to improve the range of movement in their joints and will additionally relieve any pain they’re experiencing. Senior can also use the water as a means of adding resistance to their joint movements in order to exercise the strength in their arms and legs. When they push their legs and arms against the water, it’ll improve senior muscle strength and coordination. One of the main goals of hydrotherapy treatment is to give seniors with arthritis the confidence to be able to manage a series of exercises once their course of treatment has ended. A physiotherapist or doctor attending to a senior will often suggest that he or she continues to do the recommended exercises in a local heated swimming pool to help manage arthritis pain in the future. Seniors can always ask their doctor for advice about using hydrotherapy as a way to treat their specific type of arthritis. It’s also a good idea for seniors to talk to a hydrotherapy instructor about arthritis pain and its effects so they can adjust exercises for them accordingly. If your senior loved one could use mobility support and training to manage his or her arthritis symptoms, Home Care Assistance can help. As a leading provider of senior home care Rhode Island families can trust, our dedicated caregivers work around the clock to accommodate your loved one in the comfort and safety of home. Call us today at (401) 284-0979 and schedule a free consultation.